Hellephants are ravenous beings with profound ties to sacrificial magic, thirsting for violence as much as they do the bloody feast it provides. Hearing rumours of the Darkness's return drew them to the north, where they throw themselves into murderous campaigns to fulfill both their bellies and the Darkness's insidious goals. 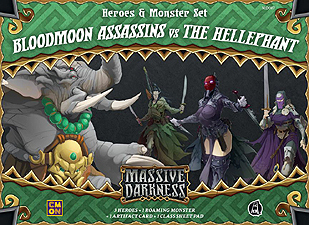 This Heroes & Monster box contains a Roaming Monster, three Heroes, an Artifact, and a new Hero Class for Massive Darkness The Hellephant is a Melee and Magic monster negating the magical effects of Heroes' weapons. The Bloodmoon Assassin Class focuses on deadly Melee attacks, taking full advantage of the shadows to kill its targets with a single blow. All three Hero miniatures may be used as additional or alternative characters for your game.. Massive Darkness is a dungeon-crawling board game for 1 to 6 players. With no game master and streamlined rules, players take their heroes on a series of quests to defeat the forces of Darkness. A Massive Darkness game is needed to play with this expansion.